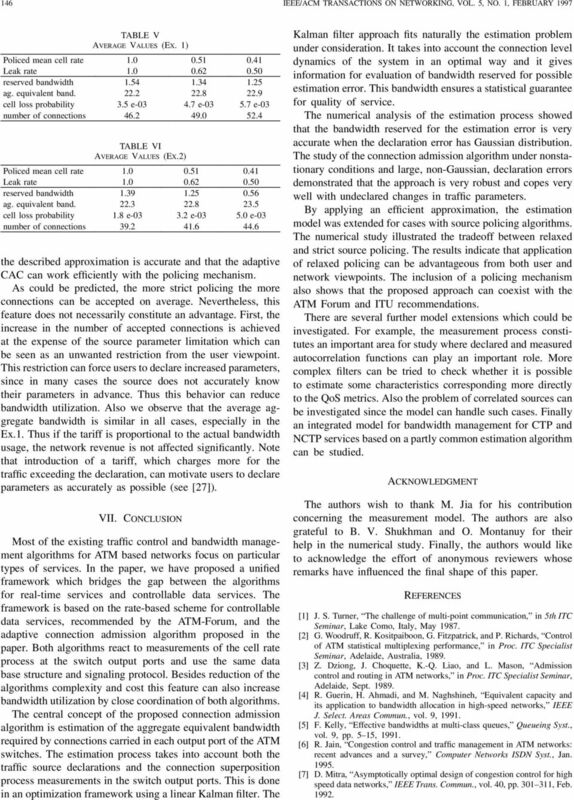 Download "TRAFFIC control and bandwidth management in ATM"
10 DZIONG et al. : A FRAMEWORK FOR BANDWIDTH MANAGEMENT 143 In this case, the quality is defined for the critical case where the residual capacity is equal to the one required by a new connection. Observe that condition (45) is also fulfilled when (46) The latter condition constitutes the basis for design and evaluation of the proposed connection admission procedure. In analogy with, the bandwidth reserved for a new connection,, can be decomposed into two parts, the equivalent bandwidth,, evaluated from the declared parameters and the bandwidth,, reserved for the declaration error. Note that the sum could be evaluated from the superposition of distributions of and Nevertheless, from the connection admission viewpoint it is more convenient to separate evaluation of from evaluation of The main reason behind this approach is that in this case the processing of the CAC control cell in a transit ATM node is limited to a simple comparison of two numbers (otherwise, some more complex calculation would have to be performed). 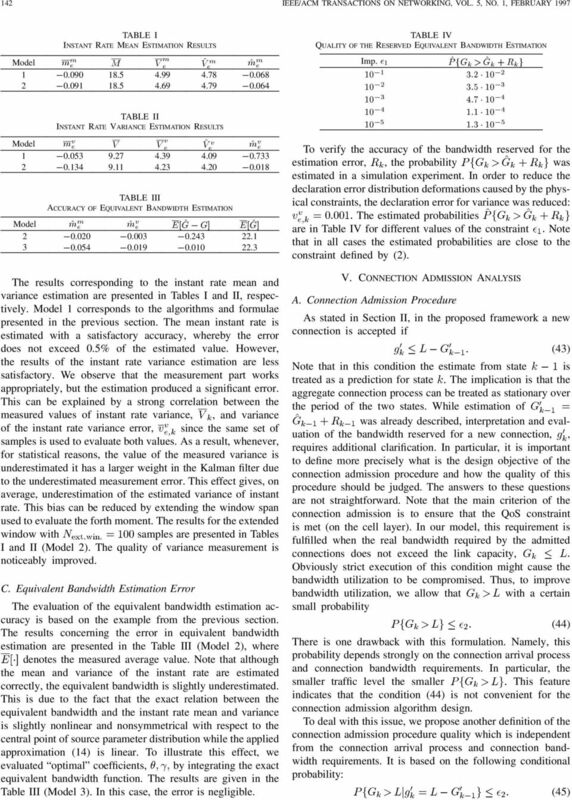 Based on the Gaussian assumption, the bandwidth reserved for the declaration error can be evaluated from (47) where the value of the constraint can be chosen between (conservative) and (optimistic). Another possibility is to apply an approach where the parameter is defined by the connection peak rate,, (48) This approach is simpler and safer since the peak rate defines the upper boundary for the error. In the following, we use the second approach. B. Numerical Examples We start by describing a simulation model used for assessment of the proposed algorithms. To avoid excessive complexity we simplified the simulation model as much as possible to concentrate on the main issues. In particular, only the instant rate layer is modeled and the link buffer has zero length. It should be stressed that the buffer-less case was chosen only to simplify evaluation of the exact equivalent bandwidth allocation. This choice does not restrict the analyzed CAC model applications nor limit generality of the results. This follows from the fact that the CAC algorithm operates on the notion of the equivalent bandwidth in a way which separates the issue of CAC adaptiveness from buffer dimensioning and performance measure on the cell layer. Moreover, the buffer-less case exemplifies the burst scale layer model whose performance is critical for a robust CAC algorithms for real-time services. The requests for connections of particular class are generated with intensity (Poissonian distribution) and mean holding time (exponential distribution). The connections are of on off type and are described by the peak rate,, average burst length,, (with programmable distribution) and the average silence length, (exponential distribution). The QoS constraint (cell loss probability ) is set to a relatively high value in order to achieve a reliable estimate of the cell loss probability distribution under nonstationary traffic conditions. 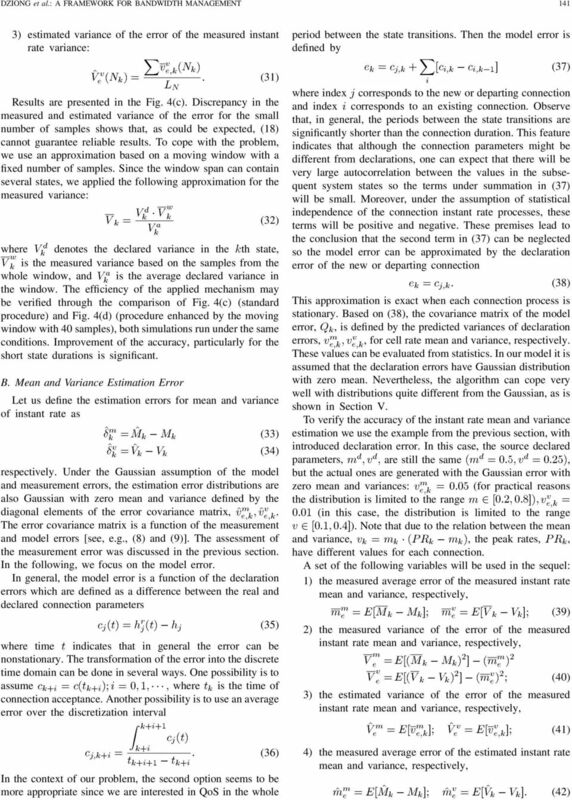 The estimation error constraint is set to the same value, The declaration error can be generated in many ways. 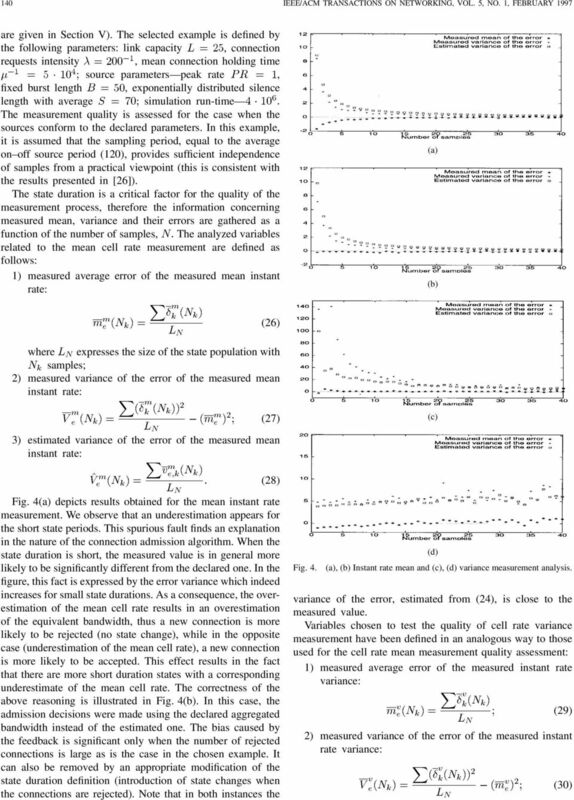 The results presented in the previous section (henceforth, referred to as Ex.1) are based on the Gaussian model for this error distribution, which conforms with the Kalman filter assumptions. 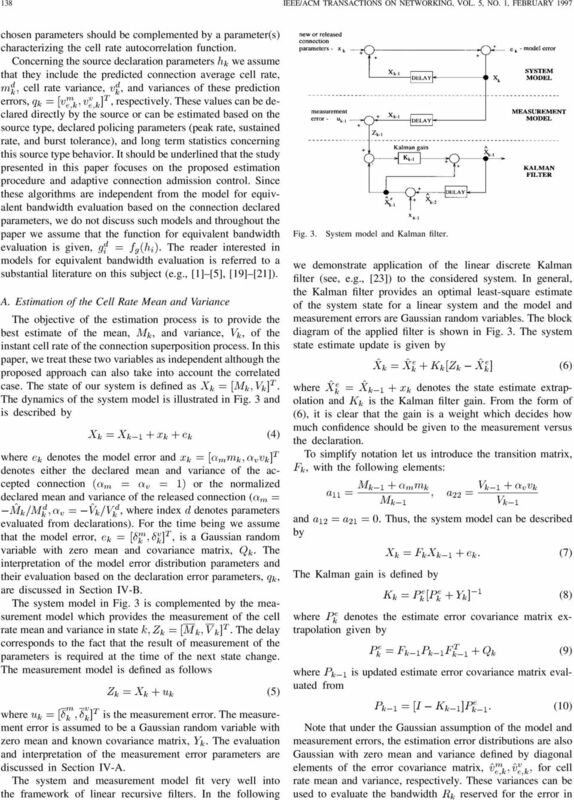 In this section, we introduce another error model which is significantly different from the Kalman filter assumption. Namely, the error generator has two cyclic states ( on and off ) with the same period When the generator is in the state on all connections accepted in this state are generated with the burst length larger than the declared one In the off state, all new connections are generated with the declared burst length (for entire duration of the connection). Note that in this case the error has no zero mean. The reason for this model is to evaluate the adaptation scheme under more stressing conditions. 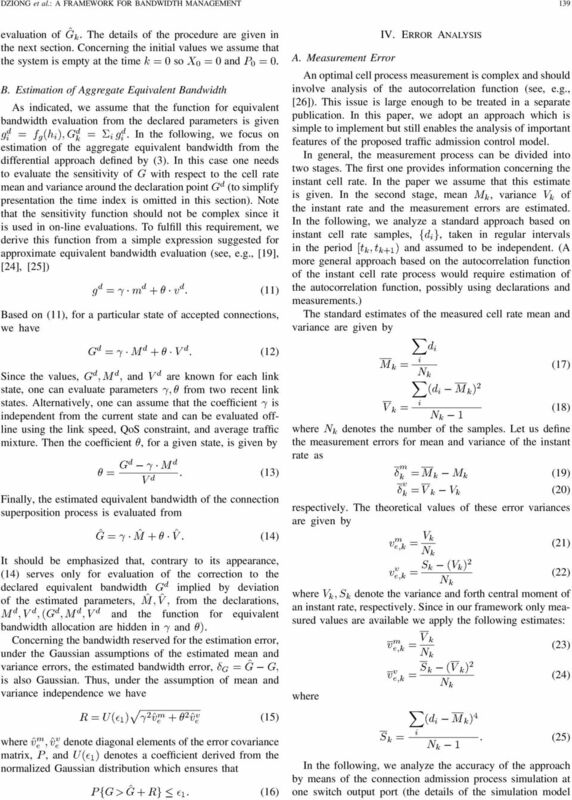 The binomial distribution is used to evaluate both the equivalent bandwidth from the source declarations,, and the exact aggregate equivalent bandwidth based on the real connection parameters parameters, (to assess the accuracy of the adaptation scheme). 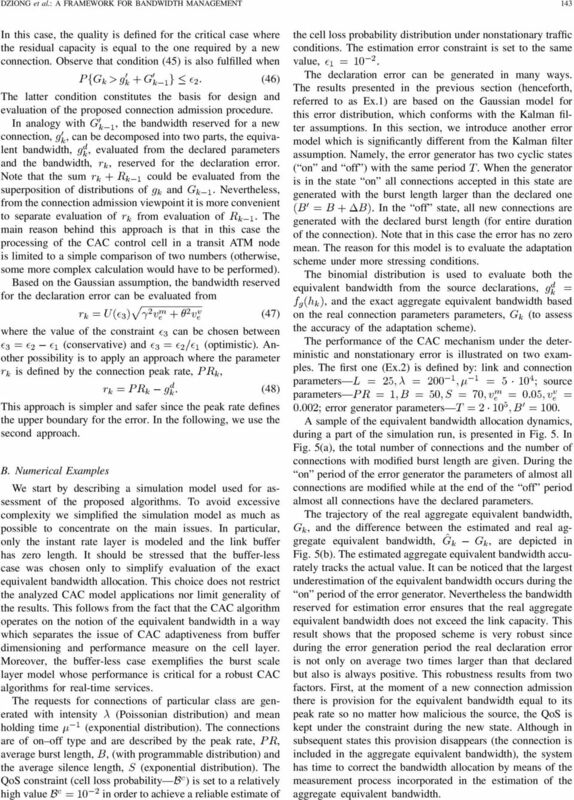 The performance of the CAC mechanism under the deterministic and nonstationary error is illustrated on two examples. 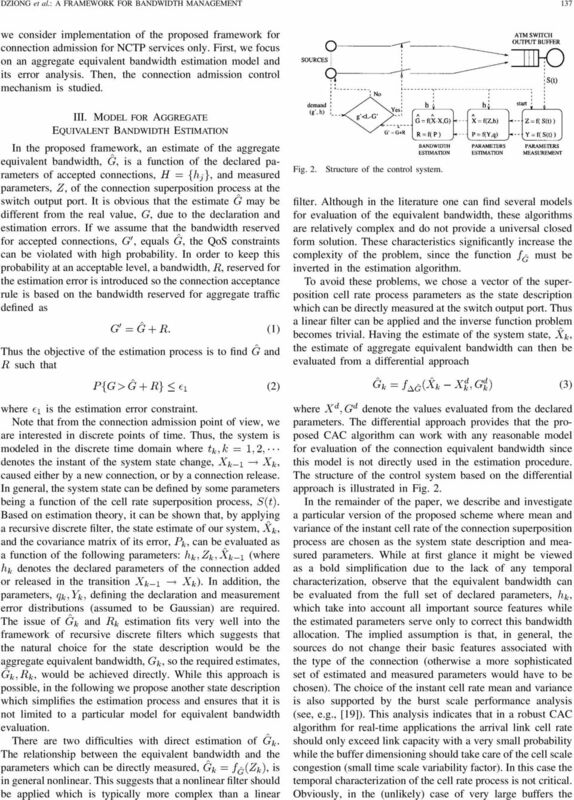 The first one (Ex.2) is defined by: link and connection parameters source parameters error generator parameters A sample of the equivalent bandwidth allocation dynamics, during a part of the simulation run, is presented in Fig. 5. In Fig. 5(a), the total number of connections and the number of connections with modified burst length are given. During the on period of the error generator the parameters of almost all connections are modified while at the end of the off period almost all connections have the declared parameters. The trajectory of the real aggregate equivalent bandwidth,, and the difference between the estimated and real aggregate equivalent bandwidth,, are depicted in Fig. 5(b). The estimated aggregate equivalent bandwidth accurately tracks the actual value. It can be noticed that the largest underestimation of the equivalent bandwidth occurs during the on period of the error generator. Nevertheless the bandwidth reserved for estimation error ensures that the real aggregate equivalent bandwidth does not exceed the link capacity. This result shows that the proposed scheme is very robust since during the error generation period the real declaration error is not only on average two times larger than that declared but also is always positive. This robustness results from two factors. First, at the moment of a new connection admission there is provision for the equivalent bandwidth equal to its peak rate so no matter how malicious the source, the QoS is kept under the constraint during the new state. Although in subsequent states this provision disappears (the connection is included in the aggregate equivalent bandwidth), the system has time to correct the bandwidth allocation by means of the measurement process incorporated in the estimation of the aggregate equivalent bandwidth. 14 DZIONG et al. 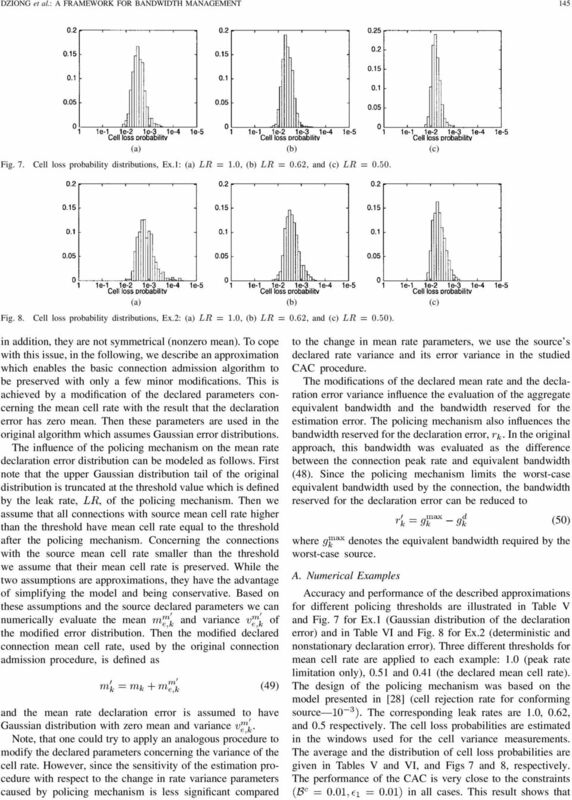 : A FRAMEWORK FOR BANDWIDTH MANAGEMENT 147  K.-Q. Liao and L. G. Mason, A congestion control framework for broadband ISDN using selective window Control, in Proc. Broadband Communications 94, Paris, France, Mar  T. E. Tedijanto and L. Gun, Effectiveness of dynamic bandwidth management mechanisms in ATM networks, Proc. INFOCOM 93, San Francisco, CA,  H Saito., Dynamic call admission control in ATM networks, IEEE J. Select. Areas Commun., vol. 9, Dec  H. Kroner and T. Renger, and R. Knobling, Performance modeling of an adaptive CAC strategy for ATM networks, in Proc. ITC-14, Paris, France, June  R. Griffiths and P. Key, Adaptive call admission control in ATM networks, in Proc. ITC-14, Paris, France, June  R. J. Gibbens, F. P. Kelly, and P. B. Key, A decision-theoretic approach to call admission control in ATM networks, IEEE J. Select. Areas Commun., vol. 13, pp , Aug  S.-Q. Li, S. Chong, and C. L. Hwang, Link capacity allocation and network control by filtered input rate in high-speed networks, IEEE/ACM Trans. Networking, vol. 3, Feb  C. D. Pack and B. A. Whitaker, Kalman filter models for network forecasting, Bell Syst. Tech. J., vol. 61, no. 1, pp. 1 14,  P. Chemouil and J. Filipiak, Kalman filtering of traffic fluctuations for real-time network management, Annales des Telecommun., vol. 44, nos. 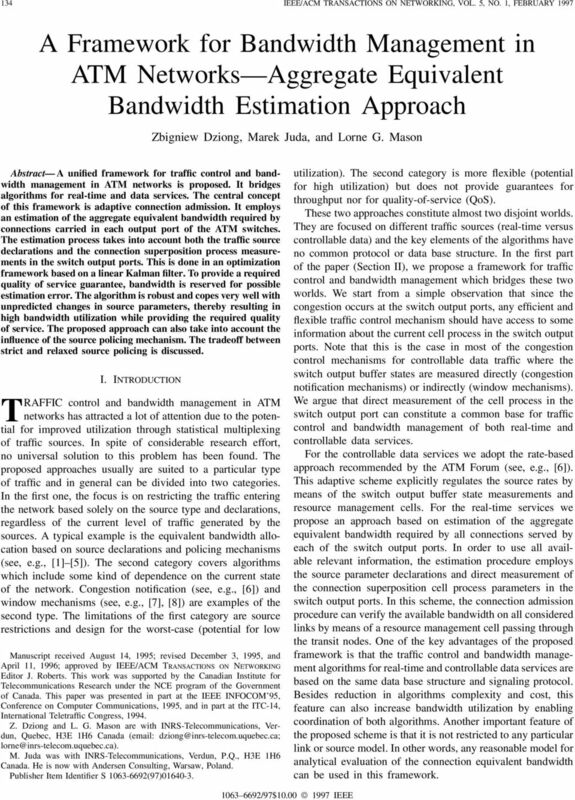 11/12, pp ,  Z. Dziong and L. Mason, Call admission and routing in multi-service loss networks, IEEE Trans. Commun., vol. 42, Apr  P. E. Boyer and D. P. Tranchier, A reservation principle with applications to the ATM traffic control, Computer Networks ISDN Syst., vol. 24, pp ,  J.W. Roberts, Performance evaluation and design of multi-service networks, COST 224 final report Oct  G. Gallassi, G. Rigolio, and L. Fratta, Bandwidth assignment and bandwidth enforcement policies, in Proc. GLOBECOM 89, Dallas, TX,  Z. Dziong, K-Q. Liao, and L. Mason, Effective bandwidth allocation and buffer dimensioning in atm based networks with priorities, Computer Networks ISDN-Systems, vol. 25, pp , May  M. Veeraraghavan, T. F. La Porta, and W. S. Lai, An alternative approach to call/connection control in broadband switching systems, in IEEE BSS 95, Poznan, Poland, Apr  A. Gelb, Applied Optimal Estimation. Cambridge, MA: MIT Press,  A. Gach, C. Mialaret, and P.E. Allard, An Experimental Evaluation of Call Acceptance Management Algorithms in ATM Based Networks, in Proc. CCECE-92, Toronto, Ont., Canada, Sept  M. Ritter and P. Tran-Gia, Eds., COST 242 Mid Term Seminar, l Aquila, Sept  H. Yamada and S. Sumita, A Traffic Measurement Method and its Application for Cell Loss Probability Estimation in ATM Networks, IEEE J. Select. Areas Commun., vol. 9, pp , Dec  F. Kelly, Tariffs and effective bandwidths in multiservice networks, in Proc. ITC-14, Antibes Juan-les-Pins, France, June  K-Q Liao., Z. Dziong, L. Mason, and N. Tetreault, Effectiveness of leaky bucket policing mechanism, in Proc. 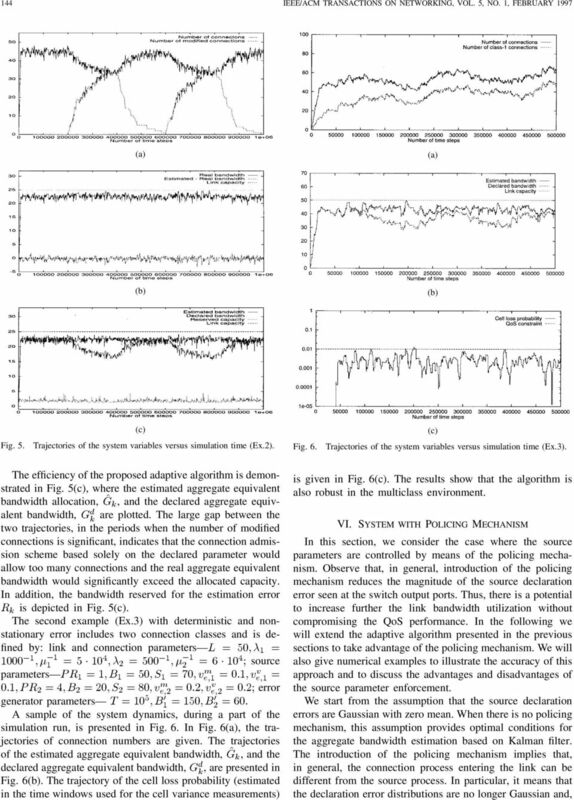 ICC 92, Chicago, IL,  Z. Dziong, M. Juda, A. Jajszczyk, and L. G. Mason, Influence of UPC on connection admission based on measurements in ATM switch output ports, in 1st Workshop ATM Traffic Management WATM 95, Paris, France, 1995, pp Marek Juda received the M.S. degree in electrical engineering and Diplome d Ingenieur from The Franco-Polish School of New Information and Communication Technologies, Poznan, Poland, in In 1994, he had an Intership with INRS- Telecommunications, Montreal, Canada, where he was involved in research concerning adaptive bandwidth management in ATM networks. Since September 1995, he has been working with Andersen Consulting s Warsaw-based practice, where his primary interest is in network solutions and the communications industry. Lorne G. Mason received the B.Sc. and Ph.D. degrees from the University of Saskatchewan, Canada, both in mechanical engineering, in 1963 and 1972, respectively. He was with Bristol Aerojet, Winnipeg, Manitoba, from 1963 to 1965, where he was involved in the design of the Black Brant rockets. He joined the British Columbia Telephone Company as a Traffic Engineer in 1966 and again in 1972 as a Consultant for planning digital networks. In 1973, he served as a Consultant to Yale University, where he, in collaboration with Prof. K. S. Narendra, pioneered the use of learning automata for adaptive routing in telecommunication networks. Between 1974 and 1977, he was with Bell-Northern Research, Ottawa, Canada, where he developed planning tools and methods for digital network evolution and state-dependent routing. Since 1977, he has been with INRS-Télécommunications, where he currently holds the title of Full Professor. He also holds a position of Professeur Associé at ENST (Télécom Paris). His primary research interests are in the application of control theory and operations research methods to telecommunication network design and management. He has held numerous industrial research contracts and NSERC strategic grants in the area of broadband network design and analysis and has numerous publications on the subject. He is a participant in the Network of Centers of Excellence program sponsored by the Canadian government, where he is Project Leader on broadband network control. He has authored or co-authored over 60 papers on broadband comunications and is editor of the Proceedings of the IFIP-IEEE sponsored Conference Broadband Communications 96, where he served as General Chairman. 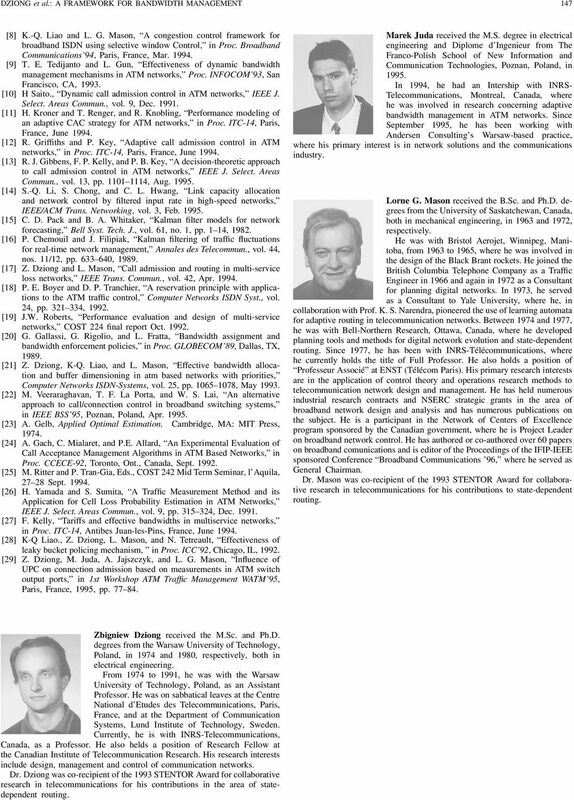 Dr. Mason was co-recipient of the 1993 STENTOR Award for collaborative research in telecommunications for his contributions to state-dependent routing. Zbigniew Dziong received the M.Sc. and Ph.D. degrees from the Warsaw University of Technology, Poland, in 1974 and 1980, respectively, both in electrical engineering. From 1974 to 1991, he was with the Warsaw University of Technology, Poland, as an Assistant Professor. He was on sabbatical leaves at the Centre National d Etudes des Telecommunications, Paris, France, and at the Department of Communication Systems, Lund Institute of Technology, Sweden. Currently, he is with INRS-Telecommunications, Canada, as a Professor. He also helds a position of Research Fellow at the Canadian Institute of Telecommunication Research. His research interests include design, management and control of communication networks. Dr. Dziong was co-recipient of the 1993 STENTOR Award for collaborative research in telecommunications for his contributions in the area of statedependent routing. Quality of Service in ATM Networks Components of a QoS Network 1. At network entrance: Policing and Shaping 2. Somewhere in the network: Admission Control 3. At switches: Classification, Scheduling 4. Maximizing the number of users in an interactive video-ondemand. Citation Ieee Transactions On Broadcasting, 2002, v. 48 n. 4, p.
Copyright. Network and Protocol Simulation. What is simulation? What is simulation? What is simulation? What is simulation? Using median filtering in active queue management for telecommunication networks Sorin ZOICAN *, Ph.D. Cuvinte cheie. Managementul cozilor de aşteptare, filtru median, probabilitate de rejectare, întârziere. Chapter 5 Adaptive Fuzzy Logic Control of ABR Traffic Flow in ATM Networks In this chapter the operation of the adaptive fuzzy explicit rate marking (A-FERM) congestion control algorithm is discussed.